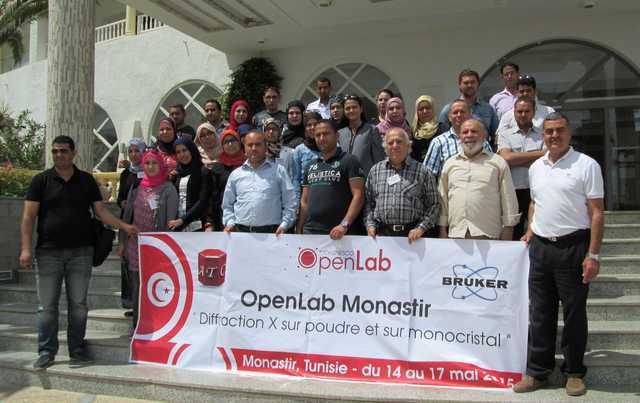 The IUCr-UNESCO OpenLab Tunisia was organized in partnership with Bruker France and held in the form of a travelling lab, making use of the portable Bruker D2 powder diffractometer. Logistical organization and lecturing were provided by members of the Tunisian Crystallographic Association (ATC) with the support of local universities and laboratories. Two stops were made: Monastir, from 14 to 17 May 2015, and Nabeul, from 20 to 23 May 2015. The first stop was held at Hotel El Habib in Monastir. Due to space limitations, the workshops were limited to 35 participants, including 27 PhD, 5 Master students and 3 technicians, coming from different Tunisian universities 34 participants, including 29 PhD, 2 Master students and 3 technicians, coming from different Tunisian universities (Sfax: 13; Monastir: 7; Tunis: 5; Bizerte: 2; Borj-Cédria: 1; Gabès: 2; Gafsa: 1; Mahdia: 1; Sidi-Thabit: 1) plus one from Algeria. The main objective of this event was to improve both the crystallographic theoretical knowledge and the experimental skills of the participants. The training sessions were carried out by local experts of the ATC (Prof. Mohsen Graia, Prof. Mohamed Oumezzine, Prof. Habib Nasri and Dr Nasr Sdiri), supported by five crystallographers from the physical-chemistry of materials research units of Monastir (Hassen Bachoua, Marwene Oumezzine, Amel Hassine) and Sfax (Issam Omri, Fadhila Edhokkar), who ensured a smooth functioning of the workshops. The opening ceremony was hosted by the ATC President, Prof. Mohamed Oumezzine; the organizer of the OpenLab, Dr Mohsen Graia; and the Bruker France delegate, Dr Loïc Le Dréau. The lecturers successfully developed the theoretical part: theory of diffraction of X-rays, X-ray diffraction from powder, pattern matching, structure refinement by the Rietveld method, preparation of the CIF file and use of the publCIF and checkCIF tools, the CCDC ConQuest software, and resolution and refinements of large molecules with disorder. Workshop 1 was dedicated to demonstrating the diffraction equipment and hardware, i.e. X-ray tubes, filters, monochromators and detectors (fluorescent screens, photographic films, Geiger–Muller and scintillation counters). Workshop 2 was devoted to preliminary operations, such as choosing crystals at the microscopes and mounting. Workshop 3 and 4 were held by Dr Loïc Le Dréau, who introduced the D2 Phaser diffractometer and demonstrated its use. In workshop 5, Dr Mohsen Graia held a tutorial about structure resolution and refinement from single-crystal XRD data. First, two simple structures were processed. Subsequently, five other compounds, characterized by occupational disorder, were presented. The second stop was held at the Institut Préparatoire aux Etudes d’Ingénieur de Nabeul (IPEIN) of the University of Carthage in Nabeul. In addition to support from the IUCr, UNESCO and Bruker France, the IPEIN contributed partially to financial, human and material resources for running the OpenLab. Nineteen participants from Algeria, Tunisia and Côte d’Ivoire were present (47% female). The opening ceremony was hosted by Prof. Abdessattar Barhoumi, head of the IPEIN, Dr Loïc Le Dréau from Bruker France and Prof. Habib Boughzala from the Laboratory of Materials and Crystallochemistry (LMC), first Vice-President of the ATC and organizer of this OpenLab. Three sessions on single-crystal diffraction were tutored by Dr Loïc Le Dréau, with the support of Mr Tarek Rhaiem from the LMC. Prof. Habib Boughzala gave six lectures on powder diffraction, symmetry and the CIF tools, helped by Mr Khalil Bouzazi from the LMC. At the end of the tutorial sessions, participants could take advantage of the Bruker D2 diffractometer to collect XRD data from their own samples. The last day of the OpenLab was dedicated to analysis and treatment of these data. 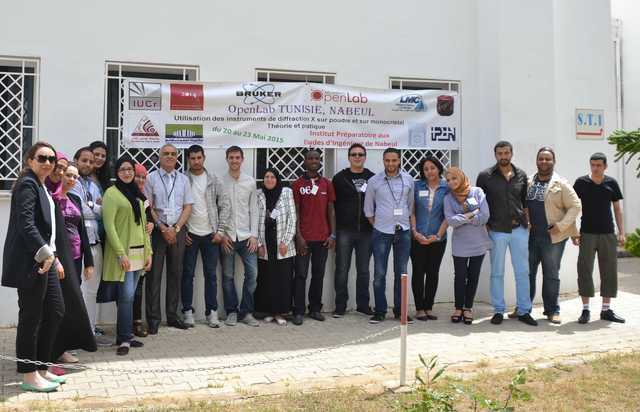 The OpenLab Nabeul was very much appreciated by the participants, who sent very positive feedback. “It was one of my best professional experiences and I have received a large amount of knowledge in X-ray diffraction,” said Mr Sofien Saidani from Bizerte (Tunisia); Mr Eric Ziki from Côte d’Ivoire expressed his gratitude for a very fruitful and enjoyable experience: “it is like having a second family, the atmosphere was pleasant, everyone was so kind and the lecturers made difficult topics accessible to anyone thanks to their skills and humour”.